If you happen to have a Japanese PlayStation 3 account with access to a little bit of yen, you're in for a treat: Rockman: Power Battle Fighters is now available as a PS2 Classic! Originally published in 2004 in Japan, Power Battle Fighters is a compilation of the two arcade games Rockman: The Power Battle and Rockman 2: The Power Fighters. Exclusive to these PS2 ports, a new, but admittedly bare bones 1 on 1 versus mode. 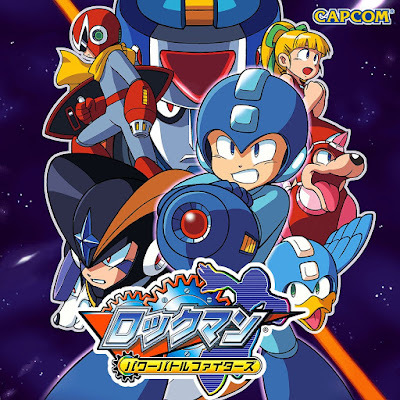 Here players can fight each other as Rockman, Blues, Forte or Duo with all of their special weapons readily unlocked. The ability to block and counter attack with a single button have been added for balance, too. Rockman: Power Battle Fighters will set you back 1,234 yen. Thanks to Vhyper1985 for the tip! Although releasing this on the US and European PS Store as is would be fine as well. ...and while they're at it, MM5 and 6 Complete Works as well! It's not incredibly complicated. First you need to create a Japanese email address, then you need to create a new profile on your PS3. Using the Japanese email address, you would then create a Japanese PSN account. In order to buy an item you'd probably want to get a Japanese Playstation Store card, which you can get through a site like Play-Asia. There are step-by-step guides online, but that'st he gist of it. A cheaper option, if you a have PS2 available, is to just get the Mega Man Anniversary Collection. It doesn't have the 1-on-1 fighting option this offers, but it basically offers upgraded versions of 1-6 based on the Complete Works releases (although lacking some features) along with 7 and 8 and both arcade games. It's a steal. One thing I really enjoyed was the way Plant Man shouts out his weapon name. It would be great if this could come to our PSN as well.